Better Collaboration Means Better Client-Agency Relationships and Better Work! Client-agency relationships that are better orchestrated can deliver +69% better performance. The micro-segmentation of marketing and advertising services plus new entrants in the agency space have made things more complicated both for marketers and their agencies. Agencies may be tempted to grapple with co-competitors for a larger slice of the client’s budget. Marketers need to orchestrate their agencies to minimise friction and overlap whilst holding them individually and collectively accountable for the end deliverables. The metrics from our database of 19,000 individual client-agency relationships, spanning 92 countries reveals the ‘size of the prize’. We created a metric that measures the quality of the collaboration between clients and their multiple agencies. This was done by clustering the multiple factors that we use to evaluate the client and agencies relationship. There was a staggering difference between the performance of the top and bottom 10% of clients. As the chart shows, the worst achieved a collaboration score of just 50.1 compared to the best at 84.9. That’s an opportunity to achieve a 69% uplift in performance. 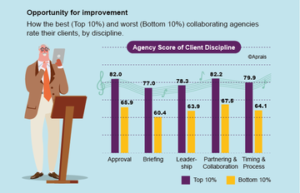 Further analysis reveals that across key disciplines, the rating of agency performance differs dramatically depending on how well their clients are seen to collaborate. 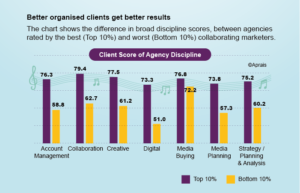 For example, as the chart shows, marketers who are rated in the bottom 10% on a collection of collaboration measures, score their agencies a low 51 for ‘Digital’ competence. Whereas better collaborating marketers achieve an average score of 73.3 for the same discipline! Unsurprisingly, ‘Collaboration’ scores highest (79.4). Despite the protestations of marketers, it’s not enough for companies to simply call on agencies to change and adapt their structures. Clients must also become better at managing collaboration with and among their agency partners. Failure to do so will lead to worse integrated solutions – even if they hire top agencies. 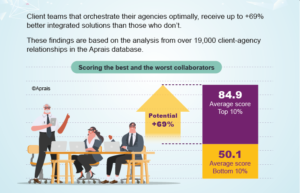 When the best and worst collaborating agencies rate their clients (clustered here into key disciplines) top collaborating agencies score their clients considerably higher than the worst collaborating agencies. In fact, among the disciplines, ‘Partnering and Collaboration’ achieves the highest score (82.2). Achieving a high quality of collaboration between clients and their multiple agencies is difficult but there are huge rewards for those that succeed. Clients must establish well defined boundaries of engagement and be willing (and capable) of actively orchestrating their agency resources. Collaboration pays. The potential rewards are well worth the effort.